Posted February 21st, 2009 at 10:12 am | Log in to reply. THANK YOU SOOO MUCH MAANCHI! It’s a lot of work involved but definately worth it at the end! Posted February 13th, 2009 at 5:33 pm | Log in to reply. I usually finish eating this amount in the recipe in a week. Posted February 13th, 2009 at 1:55 pm | Log in to reply. how long do you think this will last in the refrigerator before spoiling? Thanks! Posted February 12th, 2009 at 7:37 pm | Log in to reply. : ) now you can even pronounce it clearly! cool! Posted February 12th, 2009 at 12:21 pm | Log in to reply. Posted February 11th, 2009 at 7:32 pm | Log in to reply. Thanks for sharing the recipe. I had tough time to even look for the name of the dish. I tried it in Korean restaurant and just loved it first time I tasted it. Posted February 11th, 2009 at 7:08 pm | Log in to reply. haha, you are very clever! Of course you should do other things while waiting for well made sikhye! Start making it in the morning, then you will be able to eat it at dinner time. Posted February 11th, 2009 at 1:31 pm | Log in to reply. so happy you have included a shikhae recipe! my future mother in law always makes this for the church and it’s so popular, hopefully it’ll be the same with her! Posted February 10th, 2009 at 9:40 pm | Log in to reply. Yes, you can use other types of sweetener instead of white sugar. That’s just my recipe though. Even without using sugar, it’s a little sweet. * white short grain rice that’s what I use (for sushi). * If you don’t have a rice cooker, then you will have to keep the sikhye at about constant 60 degrees Celsius while it ferments. * I just use tap water and don’t find any problem until I finish sikhye. Posted February 10th, 2009 at 9:22 pm | Log in to reply. it certainly takes a long time to finish… i’ll probably have to set aside a whole morning to do it! 2. what type of sugar is suitable? can i use sugars other than white sugar? 3. i don’t have a rice cooker like you. what is an alternative method to ferment the “batch” to warm it? 4. how long can this “batch” last in the fridge? 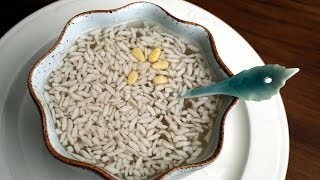 5. when you store the fermented rice, you used regular tap water. will this affect the shelf life of the rice? i ask because my family use to keep tofu and we changed the water with tap water and it caused it to go bad much faster than if we used cooled boiled water. Posted February 10th, 2009 at 8:50 pm | Log in to reply. Do you think that 식혜 can be made without sugar? Maybe using a sugar substitute like Stevia? I would like to make this for someone with 당뇨병 so I wanted to make it without sugar. What do you think? Thanks! I love the recipes/videos on your site. Posted February 10th, 2009 at 7:43 pm | Log in to reply. Fantastic! : ) Let me know how your sikhye turns out! Posted February 10th, 2009 at 10:08 am | Log in to reply. Posted February 10th, 2009 at 7:56 am | Log in to reply. yes, soondubu jjigae recipe is included in my second book. Your nice message is already supportive. Thanks a lot! Posted February 10th, 2009 at 12:30 am | Log in to reply. Thank you so much for you-tubing and posting this recipe. I bought the barley powder months ago to try and make it on my own since the canned stuff just didn’t taste as good as my friend’s homemade shikye. I totally prefer making food myself and am going to give this recipe a go tomorrow! Btw, made your soon du bu two days ago and… Wow, it was really delicious and authentic tasting!! Is this recipe in your new book? I’m wondering how we can support your efforts and express our appreciation? Thank you, Maangchi!! The video was watched 349,310 times on YouTube & has 2,359 likes!